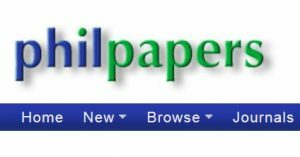 PhilPapers is a comprehensive index of philosophy books and articles by academic philosophers in all areas of philosophy, with a significant number of open access articles. The index allows users perform a simple or advanced search by words, author, publication, date and publication type or browse by structured areas, such as metaphysics and epistemology; science, logic and mathematics; and value theory; or by journal title. PhilPapers has nearly 2,000,000 entries and 190,000 registered users. Account registration allows access to some advanced features, such as saved searches, but is not required to use the database.